This document is also available in this non-normative format: Diff from previous Editors Draft. A global distributed Social Web requires that each person be able to control their identity, that this identity be linkable across sites - placing each person in a Web of relationships - and that it be possible to authenticate globally with such identities. By making distributed authentication easy one can allow everybody to protect their resources and enable their preferred privacy settings. This specification outlines a simple universal identification mechanism that is distributed, openly extensible, improves privacy, security and control over how each person can identify themselves in order to allow fine grained access control to their information on the Web. It does this by applying the best practices of Web Architecture whilst building on well established widely deployed protocols and standards including HTML, XHTML, URIs, HTTP, TLS, X509 Certificates, and RDF Semantics. There are a number of concepts that are covered in this document that the reader may want to be aware of before continuing. General knowledge of public key cryptography and RDF [ RDF-PRIMER ] is necessary to understand how to implement this specification. WebID uses a number of specific technologies like HTTP over TLS [ HTTP-TLS ], X.509 certificates [ X509V3 ], RDF/XML [ RDF-SYNTAX-GRAMMAR ] and XHTML+RDFa [ XHTML-RDFA ]. The WebID protocol enables secure, efficient and maximally user friendly authentication on the Web. It enables people to authenticate onto any site by simply clicking on one of the certificates proposed to them by their browser. These certificates can be created by any Web Site for their users in one click. The identifier, known as the WebID, is a URI whose sense can be found in the associated Profile Page, a type of web page that any Social Network user is familiar with. The WebID protocol specifies how a Service can authenticate a user after requesting his Certificate without needing to rely on this being signed by a well known Certificate Authority. This is done by dereferencing the WebID Profile, and checking if it describes the user as being in control of the the private key related to the Public Key published in the Certificate she used to authenticate. WebID authentication can also be used for automatic authentication by robots, such as web crawlers of linked data repositories, which could be agents working on behalf of users to help them in their daily tasks. The WebID protocol is not limited to authentication on the World Wide Web, but can work with any TLS based protocol. This section gives a high level overview of the WebID Protocol, and presents the organisation of the specification and the conventions used throughout the document. Section 3 on the WebID Protocol describes in detail how a server can authenticate a user. Bob is an agent who uses a Client to connect to Alice's Service, and who is responsible for the private key the Client uses to authenticate to Services. If he notices the private key was compromised he needs to take action to disable the public key. The Subject is the Agent that is identified by the WebID. When used legally it is the Subject who wishes to authenticate to a Service. We will name him Bob throughout this document to improve readability. The Subject is distinct from the Client which is used to connect to the Server. A Key Chain agent can return certificates to authorized Clients and can sign cryptographic tokens with the corresponding key. This protocol does not specify where that agent is: it could be that the Client contains his own Key Chain or it could be that the Key Chain is a separate process on the Operating System. A TLS Service is a transport level service listening on the Service port. It secures the transport layer before passing messages to the Application layer Service itself. The TLS protocol [ RFC5246 ] is applied to incoming connections: it identifies the server to the client, securing the channel and is able to request authentication credentials from the Client if needed. Server Credentials and Client credentials traditionally take the form of X509 Certificates containing a public key. The TLS protocol enables the TLS Service to verify that the Client controls the private key of the Public Key published in the certificate. Trust decisions on other attributes of the Subject published in the Certificate - such as his name - are traditionally based on the trust in the Agent that signed the Certificate - known as a Certificate Authority. A Certificate is a document that affirms statements about a Subject such as its public key and its name, and that is signed by a Certificate Authority using the private key that corresponds to the public key published in its certificate. The Certificate Authority's own Certificate is self signed. Certificates used by TLS are traditionally X509 [ X509V3 ] Certificates. A Certificate Authority is a Subject that signs Certificates. It is an Authority for what is written in the Certificate for any Agent that trusts it to be truthful in what it signs. Such agents use the knowledge of the CA's public key to verify the statements made by that CA in any of the Certificates it signed. Services usually identify themselves with Certificates signed by well known and widely deployed CAs available in all agents. A TLS-Light Service is a standard TLS Service, except that it does not do CA Based Client Certificate Authentication. If on requesting a Certificate from a Client it receives one, it simply verifies that the Client knows the private key of the public key published in the Certificate it received. Verification of attributes in the certificate is left to other services such as the WebID Verifier. A guard is an agent, usually on the Server that can look at a request from the Client and decide if it needs Authentication by looking at the Access control Rules. If it needs Authentication it can request it, and it can use the WebID Verifier to complete identity checks. Finally it can grant or deny access. A WebID Verifier takes a WebID Certificate and verifies that the Subject of the Certificate is indeed identified by the Subject Alternative Name WebID published there. This is usually done, because the TLS Service Light did not verify the SAN using a Certificate Authority signature. But it can also be done to verify that the Certificate is still valid. And it would have a WebID Profile at https://bob.example/profile Such a URI is known as a WebID. A URI that refers to an Agent - Person, Robot, Group or other thing that can have Intentions. The WebID should be a URI which when dereferenced returns a representation whose description uniquely identifies the Agent as the controller of a public key. In our example the WebID refers to Bob. A WebID is usually a URL with a #tag, as the meaning of such a URL is defined in the document. A cryptographic key that can be published and can be used to verify the possession of a private key. A public key is always included in a WebID Certificate. A structured document asserting the relationship between the Subject (identified by his WebID) and his Public Keys using relationships as defined by the Resource Description Framework [ RDF-CONCEPTS ] and published at the URL location of the Subject's WebID. Dereferencing the WebID should return the Profile Document in one of a number of formats. The Server must publish the document in at least the XHTML+RDFa 1.1 [ XHTML-RDFA ] serialization format or in RDF/XML [ RDF-SYNTAX-GRAMMAR ]. The document may be published in a number of other RDF serialization formats, such as N3 [ N3 ] or Turtle [ TURTLE ]. Any serialisation must be transformable automatically and in a standard manner to an RDF Graph, using technologies such as GRDDL [ GRDDL-PRIMER ]. Most profiles are currently written out in either of those formats. Whether or not XHTML+RDFa 1.1, both either serialization of RDF should be required serialization formats in the specification is currently under heavy debate and is open to change. The ex: namespace is a URI that refers to Bob's profile, where Bob is an imaginary character well known in security circles. The Key Chain must have a Certificate with a Subject Alternative Name URI entry. This URI must be one that dereferences to a document the user controls so that he can publish the public key for that Certificate at this URI. When creating a certificate it is very important to choose a user friendly Common Name (CN) for the user, that will allow him to distinguish between different certificates he may have, such as a personal or a business certificate, when selecting one from his browser. In the example below the CN is Bob (personal). This name can then also be displayed by any server authenticating the user as a human friendly label. The WebID URL itself should not usually be used as a visible identifier for human users, rather it should be thought of as a hyperlink in an <a href="https://..."> anchor. That is the CN should be a label and the WebID a pointer. As an example to use throughout this specification here is the following certificate as an output of the openssl program. Should we formally require the Issuer to be O=FOAF+SSL, OU=The Community of Self Signers, CN=Not a Certification Authority. This was discussed on the list as allowing servers to distinguish certificates that are foaf+SSL enabled from others. Will probably need some very deep TLS thinking to get this right. The above certificate is no longer valid, as I took an valid certificate and change the time and WebID. As a result the signature is now false. A completely valid certificate should be generated to avoid nit-pickers picking nits. Many tools exist to create a Certificate. Some keychains allow a user to create the Certificate directly with a friendly User Interface. But using a keychain on the client still requires the public key to be published on the server as detailed in the next section. It is possible to combine the creation of the key with its publication in one step in such a way as to allow the server to make the decision of what the WebID should be, by using the HTML 5 keygen element. This element can be placed in an HTML5 form, where on submitting the form, the browser asks the Key Chain to create a public and private key pair, and on receiving the public part of that keypair the Client can sends a keyrequest as part of the form to the Service. The Service can then create a WebID Certificate and return it to the Client to pass onto the KeyChain. In that way the Server is in the position to best make the decisions of what the Certificate should say and what the WebID should be without the private key ever leaving the secure Key Chain. The user experience for this Certificate creation is a one click operation. The WebID Profile document must expose the relation between the WebID URI and the Identification Agent's public keys using the cert ontology as well as the standard xsd datatypes. The set of relations to be published at the WebID Profile document can be presented in a graphical notation as follows. The document can publish many more relations than are of interest to the WebID protocol, as shown in the above graph by the grayed out relations. For example Bob can publish a depiction or logo, so that sites he authenticates to can personalise the user experience. He can post links to people he knows, where those are have WebIDs published on other sites, in order to create a distributed Social Web. He can also publish relations to protected documents, where he keeps more information for people who authenticate, such as his friend Alois or his friends friends who may not yet know him personally, such as Alice. The protocol does not depend on any particular serialisation of the graph, provided that agents are able to parse that serialisation and obtain the graph automatically. Technologies such as GRDDL [ GRDDL-PRIMER ] for example permit any XML format to be transformed automatically to a graph of relations. Yet for reasons of interoperability is has been decided that the document must be published at least in one of RDFa [XHTML-RDFA] or RDF/XML [RDF-SYNTAX-GRAMMAR]. HTTP Content Negotiation [SWBP-VOCAB-PUB] can be employed to aid in publication and discovery of multiple distinct serialisations of the same graph at the same URL. It is particularly useful to have one of the representations be in HTML or XHTML even if it is not marked up in RDFa as this allows people using a web browser to understand what the information at that URI represents. A widely used format for writing RDF graphs by hand is the Turtle notation. It is easy to learn to use, is very handy for communicating over e-mail and on mailing lists, and can then be transformed into RDF/XML automatically. It is also very similar to the SPARQL query language. There are many ways of writing out the above graph using RDFa in HTML. Here is just one example of what a WebID profile could look like. <html xmlns="http://www.w3.org/1999/xhtml" xml:lang="en" version="XHTML+RDFa 1.0" dir="ltr"
<dd style="word-wrap: break-word; white-space: pre-wrap;"
The style="word-wrap: break-word; white-space: pre-wrap;" attributes allow the number to be displayed on more than one line so that it will wrapped across lines and not just continue off to the right of the screen. RDF/XML is easy to generate automatically from structured data, be it in object notation or in relational databases. Parsers for it are also widely available. What should the time to live be on a WebID document? A WebID Certificate identifies the Subject alone and no one else, if and only if she is the only one to control the corresponding private key. It is very important therefore that the Subject take care of keeping the private key secure. This can be done by keeping it in the Key Chain of a personal machine in an account that is password protected and free of viruses, or best of all on some physical device where the private key is inaccessible to be read by any software. In the second case having the device implies that the private key has not been lost or copied. In the first case the user has to be more careful for signals of misuse. In either situation if the Subject is suspicious that his private key has been taken, then he can disable future authentications for that certificate by removing the corresponding public key from his WebID Profile. If the profile contains more than one public key for the Subject then it is suggested that each public key contain a label to help the user locate the key. In the examples above an rdfs:label with a creation date was used for this purpose. In order to give the full context of a Client interaction with a Server we will illustrate the protocol with the following sequence diagram. 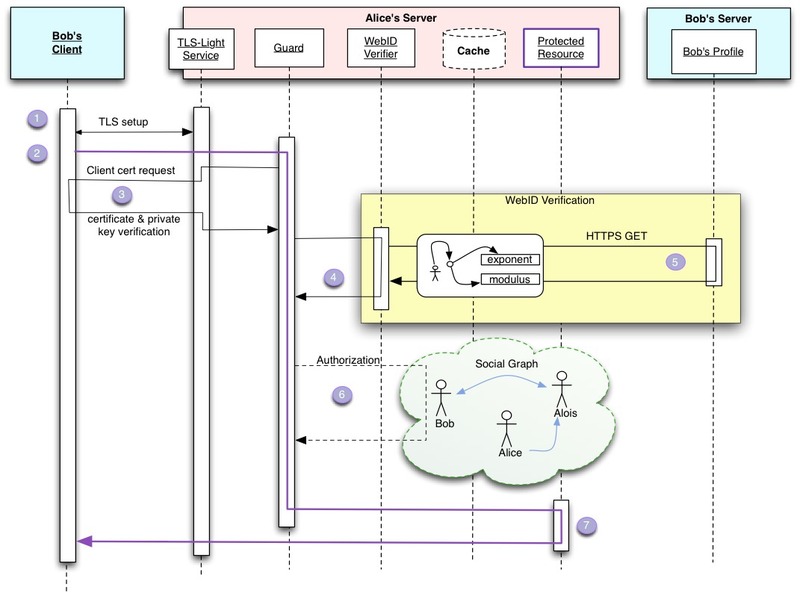 Bob initiates a connection to Alice's server via a TLS enabled protocol such as HTTPS in order to access a Protected Resource or a Protected Service. The Protected Resource must be served over a TLS-Light Service, that will not do full CA authentication of Client Certificates it receives. The Protected Resource may be a document served over HTTPS, but it could also be a SOAP service, or some other resource. This resource is protected by a Guard, which uses a WebID Verifier to verify the non Certified WebIDs found in the certificate. Once the verification succeeds the Guard checks to see if the Agent identified by the WebID is allowed access to the resource, by using trusted information from the Web and access control rules. 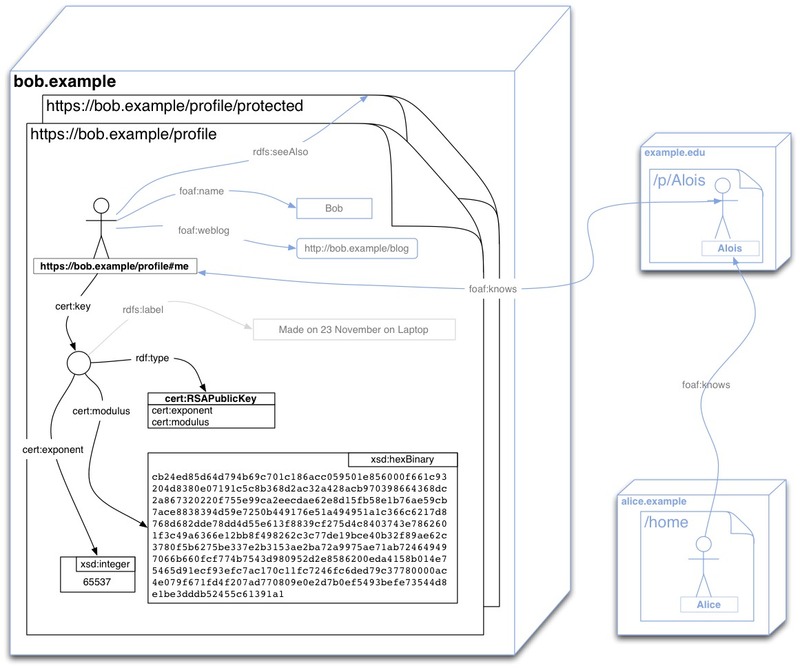 Bob's Client must open a TLS [ RFC5246 ] connection with the server which authenticates itself using well known TLS mechanisms. This may be done as the first part of an HTTPS connection [ HTTP-TLS ]. Once the Transport Layer Security [TLS] has been set up, the application protocol exchange can start. If the protocol is HTTP then the client can request an HTTP GET, PUT, POST, DELETE, ... action on a resource as detailed by [ HTTP11 ]. The Guard can then intercept that request and by checking some access control rules determine if the client needs authentication. We will consider the case here where the client does need to be authenticated. The Client asks Bob to choose a certificate if the choice has not been automated. We will assume that Bob does choose a WebID Certificate and sends it to the client. The TLS Agent must verify that the client is indeed in possession of the private key. What is important here is that the TLS Agent need not know the Issuer of the Certificate, or need not have any trust relation with the Issuer. Indeed if the TLS Layer could verify the signature of the Issuer and trusted the statements it signed, then step 4 and 5 would not be needed - other than perhaps as a way to verify that the key was still valid. The WebID Certificate is then passed on to the Guard with the proviso that the WebIDs still needs to be verified. If the WebID Verifier does not have an up to date version of the WebID profile in the cache, then it must dereference the WebID using the canonical method for dereferencing a URL of that scheme. For an https://... WebID this would be done using the [ HTTP-TLS ] protocol. With the set of verified WebIDs the Guard can then check its access control rules using information from the web and other information available to it, to verify if the referent of the WebID is indeed allowed access to the protected resource. The exact nature of those Access Control Rules is left for another specification. Suffice it to say that it can be something as simple as a lookup in a table. If access is granted, then the guard can pass on the request to the protected resource, which can then interact unimpeded with the client. This section covers details about each step in the authentication process. Standard SSLv3 and TLSv1 and upwards can be used to establish the connection between the Client and the TLS Agent listening on the Service's port. Many servers allow a simple form of TLS client side authentication to be setup when configuring a TLS Agent: they permit the agent to be authenticated in WANT or NEED mode. If the client sends a certificate, then neither of these have an impact on the WebID Verification steps (4) and (5). Nevertheless, from a user interaction perspective both of these are problematic as they either force (NEED) or ask the user to authenticate himself even if the resource he wishes to interact with is public and requires no authentication. People don't usually feel comfortable authenticating to a web site on the basis of a certificate alone. They prefer human readable text, and detailed error messages which the HTTP layer deliver. It is better to move the authentication to the application layer Guard as it has a lot more information about the application state. Please see the WebID Wiki for implementation pointers in different programming languages and platforms to learn about how this can be done and to share your experience. Once the TLS connection has been setup, the application layer protocol interaction can start. This could be an HTTP GET request on the protected resource for example. If the protocol permits it, the Client can let the Application layer, and especially the Guard know that the client can authenticate with a WebID Certificate, and even if it wishes to do so. This may be useful both to allow the Server to know that it can request the client certificate, and also in order to make life easier for Robots that may find it a lot more convenient to be authenticated at the TLS layer. Bergi proposed a header for HTTP which could do this. Please summarise it. TLS allows the server to request a Certificate from the Client using the CertificateRequest message [section 7.4.4] of TLS v1.1 [ RFC5246 ]. Since WebID TLS authentication does not rely on CA's signing the certificate to verify the WebID Claims made therein, the Server does not need to restrict the certificate it receives by the CA's they were signed by. It can therefore leave the certificate_authorities field blank in the request. From our experience leaving the certificate_authorities field empty leads to the correct behavior on all browsers and all TLS versions. A security issue with TLS renegotiation was discovered in 2009, and an IETF fix was proposed in [ RFC5746 ] which is widely implemented. As far as possible it is important for the server to request the client certificate in WANT mode, not in NEED mode. If the request is made in NEED mode then connections will be broken off if the client does not send a certificate. This will break the connection at the application protocol layer, and so will lead to a very bad user experience. The server should therefore avoid doing this unless it can be confident that the client has a certificate - which it may be because the client advertised that in some other way to the server. Is there some normative spec about what NEED and WANT refer to? The Verification Agent is given a list of WebIDs associated with a public key. It needs to verify that the agent identified by that WebID is indeed the agent that controls the private key of the given public key. It does this by looking up the definition of the WebID. A WebID is a URI, and it's meaning can be had by dereferencing it using the protocol indicated in its scheme. The fragment identifier component of a URI allows indirect identification of a secondary resource by reference to a primary resource and additional identifying information. The identified secondary resource may be some portion or subset of the primary resource, some view on representations of the primary resource, or some other resource defined or described by those representations. [...] The semantics of a fragment identifier are defined by the set of representations that might result from a retrieval action on the primary resource. In order therefore to know the meaning of WebID containing a fragment identifier, one needs to dereference the resource referred to without the fragment identifier. This resource will describe the referent of the WebID in some way. If it says that the referent of the WebID is the agent that controls the private key of the given public key, then this is a definite description that can be considered to be a definition of the WebID: it gives its meaning. The trust that can be had in that statement is therefore the trust that one can have in one's having received the correct representation of the document that defined that WebID. An HTTPS WebID will therefore be a lot more trustworthy than an HTTP WebID by a factor of the likelihood of man in the middle attacks. Once that is proven then the trust one can have in the agent at the end of the TLS connection being the referent of the WebID is related to the trust one has in the cryptography, and the likelihood that the private key could have been stolen. Add explanation for URI with redirect. The Verification Agent needs to fetch the document, if it does not have a valid one in cache. The Verification Agent must be able to process documents in RDF/XML [ RDF-SYNTAX-GRAMMAR ] and RDFa in XHTML [ XHTML-RDFA ]. The result of this processing should be a graph of RDF relations that is queryable, as explained in the next section. It is suggested that the Verification Agent should set the Accept-Header to request application/rdf+xml with a higher priority than text/html and application/xhtml+xml. The reason is that it is quite likely that many sites will produce non marked up HTML and leave the graph to the pure rdf formats. If the Guard wishes to have the most up-to-date Profile document for an HTTPS URL, it can use the HTTP cache control headers to get the latest versions. To check a WebID claim one has to find if the graph returned by the profile relates the WebID to the Certificate Public Key with the cert:key relation. In other words one has to check if those statements are present in the graph. Testing for patterns in graphs is what the SPARQL query language is designed to do [ RDF-SPARQL-QUERY ]. We will first look at how to use this as it is also the simplest method, and then what some other programmatic options may be. ?webid should be replaced by the WebID Resource. In the SPARQL notation that is the URL string would be placed between <...> in the position of the ?webid variable. ?exp should be replaced by the public exponent written as an xsd:integer typed literal. In SPARQL as in Turtle notation this can just be written directly as an integer. An ASK query simply returns true or false. If it returns true, then the key was found in the graph with the proper relation and the claim is verified. In order to allow the class of queries defined by the template above to return true when asked of graphs where the hexBinary or the exponent contains whitespace characters in initial and final position, the query engine must support the D-entailment regime for xsd:hexBinary and xsd:integer as specified in SPARQL 1.1 Entailment Regimes. For verifiers that do not have access to a SPARQL query engine but can query the RDF data programmatically, it is relatively easy to emulate the above SPARQL query programmatically. There are a number of ways of doing this, some more efficient than others. If the RDF library does datatype normalisation of all literals before loading them, then the most efficient way to execute this would be to start by searching for all triples whose subjects have relation cert:modulus to the literal which in our example was "cb24ed..."^^xsd:hexBinary. One would then iterate through all the subjects of the relations that satisfied that condition, which would most likely never number more than one, and from there filter out all those that were the object of the cert:modulus relation of the WebID - in the example bob:me. Finally one would verify that one of the keys that had satisfied those relations also had the cert:exponent relation to the number which in the example above is "65537"^^xsd:integer. For triples stores that do not normalise literals on loading a graph, the normalization will need to be done after the query results and before matching those with the values from the Certificate. Because one could not rely on the modulus having been normalized, one would have to start with the WebID - bob:me and find all it's cert:key relations to objects - which we know to be keys - and then iterate through each of those keys' modulus and exponent, and verify if the normalised version of the value of those relation is equal to the numbers found in the certificate. If one such key is found then the answer is true, otherwise the answer will be false. The Authorization step may be as simple as just allowing everybody read access. The authentication phase may then just have been useful in order to gain some extra information from the WebID Profile in order to personalise a site. Once the Guard has a WebID he can do a lookup in a database to see if the agent is allowed the required access to the given resource. Up to this point we are not much more advanced that with a user name and password, except that the user did not have to create an account on Alice's server to identify himself and that the server has some claimed attributes to personalise the site for the requestor. But the interesting thing about such a WebID is that because it is a global linkable URI, one can build webs of trust that can be crawled the same way the web can be crawled: by following links from one document to another. It is therefore possible to have very flexible access control rules where parts of the space of the user's machine is given access to friend and those friends friends (FOAF), stated by them at their domains. It is even be possible to allow remote agents to define their own access control rules for parts of the machine's namespace. There are too many possibilities to list them all here. The WebID Profile is a structured document that contains identification credentials for the Identification Agent expressed using the Resource Description Framework [ RDF-CONCEPTS ]. The following sections describe how to express certain common properties that could be used by Verification Agents and other entities that consume a WebID Profile. The e-mail address that is associated with the WebID URI. The name that is most commonly used to refer to the individual or agent. An image representation of the individual or agent. Expresses an RSA public key. The RSAPublicKey must specify the cert:modulus and cert:exponent properties. Used to associate a WebID URI with an RSAPublicKey. A WebID Profile must contain at least one RSAPublicKey that is associated with the corresponding WebID URI. cert:identity was previously used to associate an RSAPublicKey with a WebID URI. cert:identity has been deprecated in favor of its inverse property cert:key. Implementors are encouraged to publish WebID Profile Documents using cert:key. During this transitional period, implementations consuming WebID Profile Documents might still support the deprecated cert:identity as well as the stable cert:key. 2011-12-12 Fixed several errors in examples and diagrams, clarified TLS-Light, added SSL renegotiation, key chain and cache control, updated list people in acknowledgments. 2011-11-23 Wide ranging changes: Rewrote the Verification algorithm now enhanced with a detailed sequence diagram. Moved to new ontology using xsd:hexBinary datatypes and removed rsa: ontology. Rewrote vocabulary section using clearer names. All these changes required serious rewriting everywhere. 2011-02-10 Move to W3C WebID XG. Updates from previous unofficial WebID group include changes on RDF/XML publishing in HTML, clarification on multiple SAN URIs and WebID verification steps. 2010-08-09 Updates from WebID community: moved OpenID/OAuth sections to separate document, switched to the URI terminology instead of URL, added "Creating the certificate" and "Publishing the WebID Profile document" sections with a WebID graph and serializations in Turtle and RDFa, improved SPARQL queries using literal notation with cert datatypes, updated list of contributors, and many other fixes. 2010-07-25 Added WebID Profile section. 2010-07-18 Updates from WebID community related to RDF/XML support, authentication sequence corrections, abstract and introduction updates.